ABOARD THE AmaDAGIO – Around breakfast-time we finally arrived at the spot where we thought we would begin this cruise. A place of fond memories from an earlier visit, we were anxious to return to Arles, and we were not let down. We joined a coach tour to an olive oil producer and to the medieval village of Les Baux, called the most beautiful village in France. Our guide explained that bau is the Provencal word for rocky spur, or ridge, so the village’s position perched on just such a precipitous spot in the Alpilles, explains its name. With a population of 22, the village has more boutiques, souvenir shops and restaurants than residents. The main street winds uphill from the entrance to the ruined castle above. When Les Baux served as a Huguenot refuge during France’s wars of religion, it was besieged and fell to the King’s army. Reconstructed siege engines speak to the castle’s destruction. 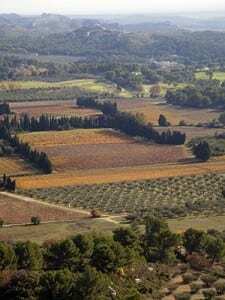 From up here, a clear day will yield views of Provence all the way to the Mediterranean; on our visit we were happy to settle for views of the idyllic valley below. Though we enjoyed a return visit to Les Baux, especially without the need to find a parking space, the olive oil producer was the real reason we signed-up for this excursion. Moulin a huile du Calanquet is on a property at the base of the Alpilles (or little Alps) a small range to the east of Arles. The property is in the fifth generation of ownership by one family, but began its current incarnation as an olive oil producer only 15 years ago. 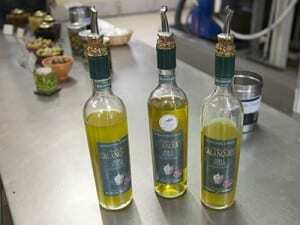 Five varieties of olives are each pressed separately to capture their individual qualities, but some are then combined to produce a blended oil, much as with regional wines. We tasted a Salonenque oil that was soft and light, an Aglandau, a fruity oil considered good for salads, and a blend, perhaps more versatile. We learned that all of their production is from the first cold press process and is considered extra virgin based on the French system of measuring acidity in the oil. We just thought it was good, and took advantage of the chance to buy some in the tiny gift shop. 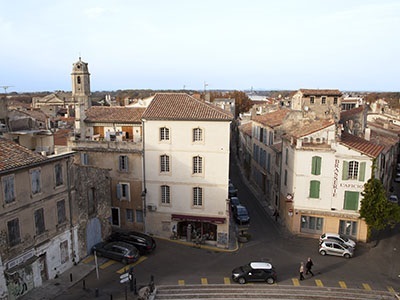 We decided to skip the afternoon walking tour of Arles so we could wander the narrow, historic streets by ourselves. We located the Bed & Breakfast + Cooking School that we enjoyed seven years earlier, before heading to the nearby Roman Amphitheater. Perhaps we should have signed-up for the walking tour since we were obliged to pay the admission fee that was included with the tour. This remarkably well-preserved structure is still in use today, though some modern—and slightly more comfortable—seating has been installed. Soon after we returned to the AmaDagio she began sailing north for the first time, and that evening we enjoyed an impressive wine pairing dinner. Wine host Steve Ledson teamed up with our vessel’s exceptional culinary team to produce an excellent demonstration of the virtues of good pairings, thereby also delivering a memorable meal. The pairing of Ledson Napa Valley Sauvignon Blanc with the starter of Trilogy des Fruits de Mer and the Ledson Dry Creek Valley Cabernet Sauvignon with the entree of Filet de Boeuf with Foie Gras seemed ideal. But we found the pairing of Ledson’s Russian River Valley Pinot Noir with the Cheese Ravioli in Boletus Sauce to be inspired. Yum, Yum, Yum! We decided to make an early evening after this feast so that we could be better prepared for our visit next day to Tournon–and wines of Hermitage.